I am so excited to present today's post! It has always been my goal for this blog to be a "sharing" experience, and this week my vision is finally taking shape. I have gained a reasonable-sized audience of like-minded people who, amazingly, seem to be interested in what I have to say. But I've always hoped my blog would become a clearinghouse of ideas, inspirational messages, and information; whereby we could all share our knowledge and help each other through whatever the future holds. And so it was with sheer delight that I opened my emails and received a message from "Lisa". It doesn't matter what her real name is or where she is from; what matters is that she had something important to convey to all of us. Through a series of personal emails, Lisa has shared some things I want to pass on to you, and I think you will find, as I did, that her example can be replicated across the globe. Lisa started by telling me that she was involved with an Emergency Preparedness Group that started up just a short 4 months ago. She lives in a small, historic, rural area and decided that she could no longer sit on the sidelines. She approached some members of the LDS Church, who agreed to help her present a program every second Tuesday of each month. The goal of this group was to present information and demonstrations for people in the surrounding area who might be interested in becoming more self-sufficient and "ready". Their meetings were free to the public, and they promoted the gathering through newspaper advertising and fliers. While initially disappointed in the low turnout, thinking that everyone would be as excited as she was to learn all they could about becoming prepared, Lisa nevertheless kept moving forward. Their meetings are not based on politics or religion; the sole purpose is to provide knowledge. Last month they covered the basics on canning and food dehydration, and the number of attendees grew. This past week a gentleman showed the group how to operate a small portable generator; informed them about appropriate wiring and what appliances could be run off that particular size. He also demonstrated how to use a chainsaw, (stressing safety factors), while also speaking about how to operate a wood stove, the different kinds of woods, and how to use a small log splitter. 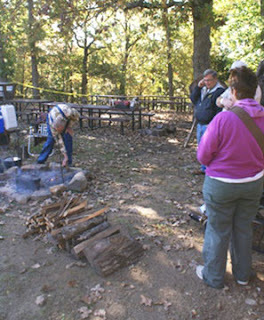 Another gentleman demonstrated different ways to start a fire, and another woman showed how to make rope from discarded binder twine from hay and straw bales. 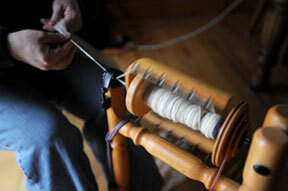 Lisa, herself, demonstrated how to spin wool from fleece, complete with spinning wheel, drop spindle and hand carders. Future meetings will include information and training for firearms, dutch oven cooking, how to read maps and compasses, radio communications, and what "wealth" really means. As Lisa pointed out, to most people "wealth" means dollars; gold and silver. But it could mean livestock, medicine, seeds, and most importantly skills. And that's why I think Lisa's group serves as an excellent model for all of us. By offering free meetings, no one is excluded, and the potential for learning valuable skills is limitless. At the end of each meeting, they always appeal to the attendees to share any ability or expertise they might have with the group. This is truly neighbor helping neighbor. But as a sign of the uncertain times we live in, Lisa also asked me to pass on the concerns of conducting such programs. It saddens me that I even need to mention this, but she is right. We must all be aware of how much we expose of ourselves and our personal information. If you decide to hold "public" meetings (and there is no reason not to; the sharing of this information is not illegal or dangerous), just be aware that you may not know everyone who attends, and in Lisa's own words, there are people out there in this upside down world that are opportunists and information-gatherers for all the wrong reasons. But that being said, do not let this inhibit you from starting up a group such as this. I would just recommend, as Lisa's group has done, to hold your meetings in a public location, and not expose your family or home to possible strangers. As your group consolidates and unites, you will know who you can trust. Start small and you will be surprised at how much information and talent there is in your sphere of community. Lisa's original goal was to provide a way for people to come together, to meet others with similar viewpoints, and to help those who are anxious to help themselves, their families, their friends and their neighbors. Lisa spent a lot of time in prayer, asking for direction from God, and she received it. She stepped forward and found others who were willing to help their neighbors by providing knowledge that would help them survive any event, come what may. You can see Lisa's heart when she proclaims, "If one person walks out of one of our meetings, and has learned something that day and puts it into action, then we've succeeded in accomplishing what God put before us!" So now, I have two challenges that I, Belle Ringer, would like to present you. First, follow Lisa's example, and start a monthly meeting. Offer it free to the public, and hold it in a church basement, at the local community hall, or approach organizations like the VFW. Start small and offer the knowledge that is sure to be found among you; who knows how to demonstrate a food dehydrator? How to bake bread? Who has knowledge about solar or wind power? You will be surprised at the people who will seek you out, once the word gets out. Secondly, I REALLY want to hear from more of you about what you are doing in your communities and towns. And that means EVERYONE! I have readers across the United States, in Canada, the United Kingdom, Australia, India, the Philippines, Croatia, Ukraine, Russia, Brazil..... the list goes on. You all have something valuable to communicate about your experiences; whether it be preparedness, your culture, your faith. Rest assured that you will remain anonymous. We are all part of this crazy world and we can learn from each other. Indeed, our shared knowledge is true power. You can email me at the link at the top of the page. Let's come together and help each other! Acts 4:32 "All the believers were one in heart and mind. No one claimed that any of their possessions was their own, but they shared everything they had." About a year ago, another family (like minded like ours) joined us to start a "homestead sharing" hour the first Sunday of the month at church. Each month we meet that evening and one of us shows/demonstrates something we have learned to become more self sufficient. We've done making your own mayonnaise, how to make a lamp with a mason jar, how to can butter, how to can bacon, edible weeds in our yards and much much more. We've also gotten really good with swapping items. I've collected broccoli seeds from my garden to give to those who wanted them, another got a great deal on a bag of purple onions and passed out the extras. We've picked up a stack of bricks from another neighbor who had no use for them (we are going to build a keyhole herb garden). It is all fun and interesting and of course our goal is to get the other individuals there to start thinking self sufficiency. We don't talk about the amount of food we've put away for an emergency, just stress that they should also have a little put away "just like you do when you know a hurricane is coming, plus maybe a little more". Some are very interested, some just smile at you with that knowing smile of "you are nuts, I can just go down and buy new seeds if I want to plant next year". Every little bit helps. Share with others, just watch how much you share about yourself. Wonderful comment! This is what I'm talking about! And it reassures me that we are spreading the word about self-sufficiency -- even if are able to escape a depression-like downturn in the economy, perhaps we can return to a lifestyle that does not rely on credit and debt. Our grandparents may not have lived a life of luxury, but they lived a "real" life, and that's what I am seeking. Thank you for sharing!